When the temperatures drop, it can be tempting to seal up your Mallard Creek Apartments tighter than Fort Knox. However, that might not always be the best plan. Keeping all the windows and doors shut tightly all winter long does keep out the cold, drafty air, but it also keeps in a lot of ick. Things like pet dander, dust mites, and mold can pile up inside your home during the winter months which can actually decrease your air quality and lead to more bouts of sickness and allergy flare-ups. There are some reports that state your apartment is up to five times more polluted during the winter months. This is mostly due to having the windows closed up for several chillier months in a row combined with the heater recirculating that same poor-quality air…over and over and over again. The winter months also mean the air is drier. This drier air pulls the moisture out of your nasal passages which is bad news because that moisture is a key element in fighting off bacteria and viruses. Combine that lower resistance with the poor air in your home, and you have a prime condition for winter illnesses. Don't despair! 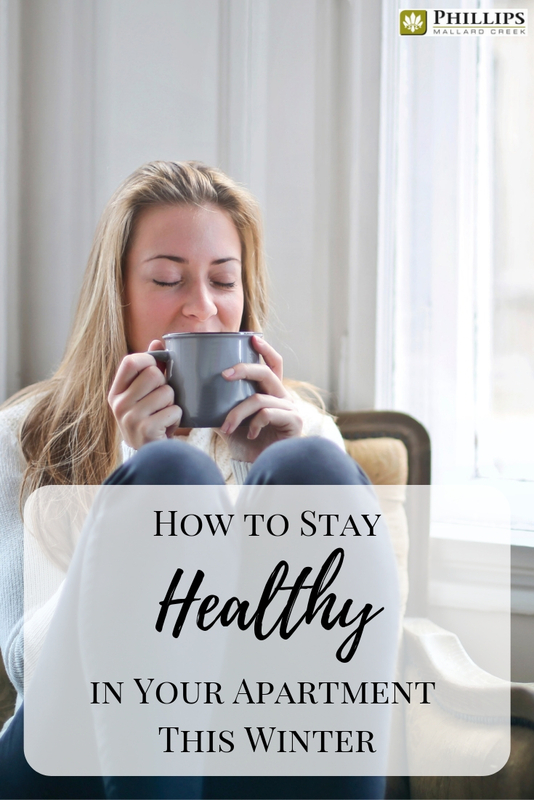 There are ways that you can stay healthy in your Mallard Creek apartments this winter. We have the tips you need to combat those lurking illnesses. Make sure you let in a little fresh air whenever you can. Ideally, you would crack a window for 5-10 minutes a couple of times per day, but that isn't always going to be possible. Days when the weather is particularly nasty or freezing cold, you may want to skip it, but for all the other days crack a window and let the old, stale air out and the brisk, fresh air in. For such a short period, it shouldn't change the temperature very much in your apartment, but it will give you the excellent benefits of flushing out a whole bunch of the ick that is floating around in your air. Like we mentioned earlier, winter air is much drier than the air other times per year. You may even notice that you get little nosebleeds while you are sleeping from the lack of moisture in the air. It is an easy fix, however. Simply add a humidifier to your Mallard Creek apartments! You can find them at many stores like Target or Walmart. It is especially helpful to run one at night while you are sleeping, but watch to make sure things are getting too moist. The area immediately around the humidifier may start getting too damp. If that happens, molds and bacteria can start to grow. You can combat this problem by moving the location of the humidifier each night before turning it on. If you want to keep things out of the air, you need to start by getting them out of your floors and off your counters. Carpeting should be vacuumed regularly, especially if you have pets. You need to get the pet dander and dust mites out of all those carpet fibers as often as possible. Your sheets are another spot where contaminants can hang out. Wash them at least once per week on the hot water or allergen setting. If you can bath your pets a couple times per month that will help as well. If your pet won't cooperate for bath time, try brushing them at least once per week (daily would be better.) If you have a patio or deck, it may be helpful to brush them outside, even in the chilly weather, to keep a lot of the hair from getting stuck in your apartment. The single best way to stay healthy all year long. Make sure you wash your hands before and after eating, after using the restroom, and before cooking. Unfortunately, you are still going to track a few germs into your Mallard Creek apartments over the winter months, but if you wash your hands often, you may be able to stop them from making you sick. When you are cleaning up, go ahead and wipe down the door handles and light switches as well. Using a bleach wipe on this often touched places can help eliminate some of the germs and keep them off of your hands. The soap and water routine at the sink will wash the rest of them down the drain. 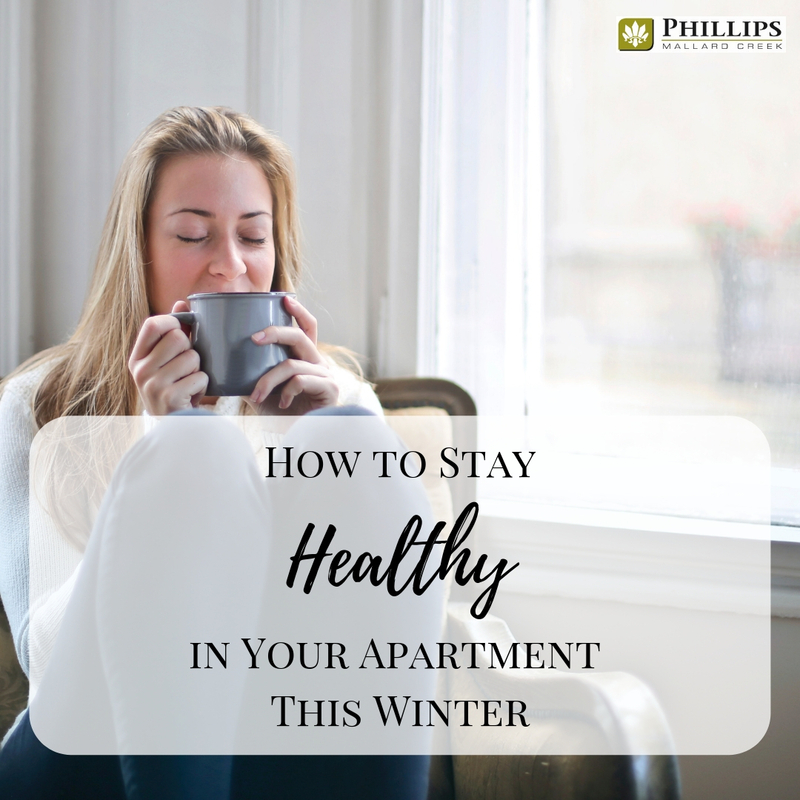 These are just four simple things that you can do to help you stay healthy in your Mallard Creek apartment this winter. You also want to make sure that your air filter is changed out as often as directed (some are monthly, some are every three months.) Make sure to eat a healthy diet full of fruits and vegetables to keep your immune system going strong.